Takoyaki, is one of the most popular Japanese Street Foods from Osaka and has been around since the early 1930's. It is made with a savory pancake batter that is shaped into round balls and filled with cooked octopus pieces. While the idea of octopus in a pancake may sound unappealing at first, but you'll be surprised at how savory, delicious, and addictive this favorite Japanese snack actually is! In fact, Takoyaki, which is originally perceived as a snack, can be a meal in itself. Delicious deep fried octopus balls, crunchy on the outside and soft on the inside with bits of freshly cooked octopus in the middle. 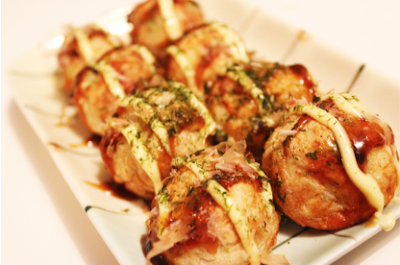 The Takoyaki octopus balls are topped with mayo and described as ‘special sauce’. The term Takoyaki is "tako", meaning octopus, and "yaki", which means grilled. Takoyaki has a very thin, and almost crisp grilled exterior with a very soft, almost liquid center, with a tender or slightly chewy bite of cooked octopus. Sounds pretty tasty, don't you think? Do you know where to go to satisfy your fried chicken cravings? Forget KFC, crave fried chicken - think about Kara-age! 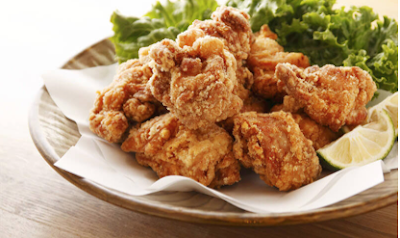 Inspired by Chinese fried chicken recipes, Kara age means “Tang fried” (Tang as in the Chinese dynasty), which is an umbrella term for any chicken that's coated in either potato starch or flour and fried. It was adapted from the Chinese culinary repertoire and turned into something uniquely Japanese. For supreme-flavored bites, you can't beat crispy fried chicken marinated in soy sauce, garlic and ginger, coated lightly with flour, and deep fried. With Kara age chicken by your side, you'll never want to eat takeaway chicken again! At Two Hands Bar, our Kara age chicken is served with a side of white rice and salad. We also recommend you ask for a fresh dollop of mayonnaise to compliment this extremely tasty dish! Annyeonghaseyo Hanguk ! Hello Korea ! 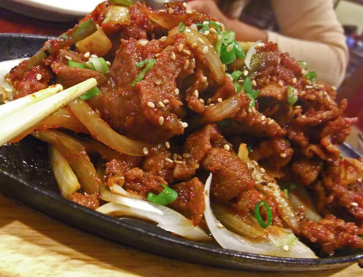 Bulgogi is one of the most well-known Korean foods that consists of Bul is the Korean word for fire and gogi is meat, therefore, it translates into fire meat. This yummy dish is made from thinly sliced sirloin or another prime cut of beef. It is marinated in a mixture of soy sauce, sesame oil, black pepper, garlic, onions, ginger, and sugar for two to four hours to enhance the flavor and its tenderization. 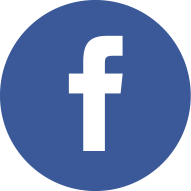 Whole cloves of garlic, sliced onions, and chopped green peppers are often grilled or cooked at the same time. It is often served to non-Koreans as a first taste of Korean cuisine. This delicious Bulgogi serves with a bowl of steamed rice or p air it with burger and some vegetables or salad. You'll have a most satisfying meal in the snap of your fingers.